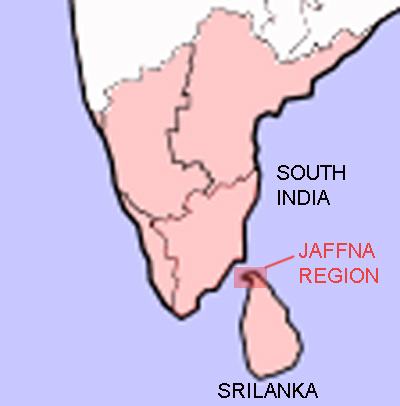 Map showing the location of Jaffna Region in relation to South India and Sri Lanka. During the legal registration ceremony. 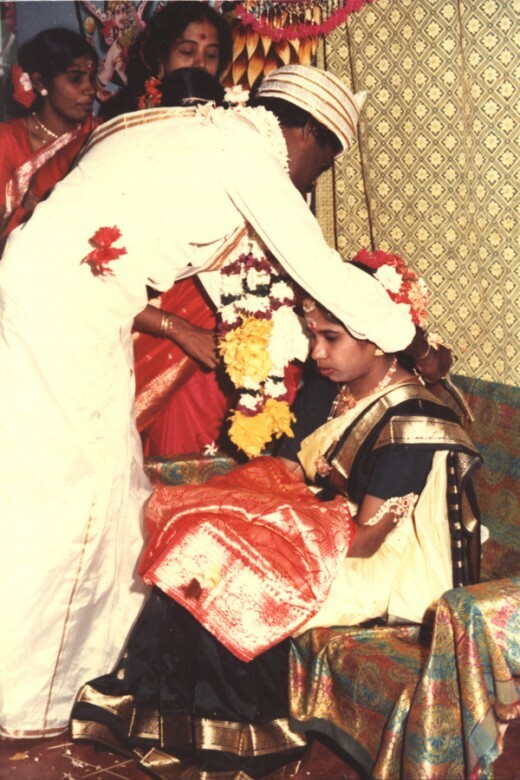 Note the groom is seen in western dress. Jaffna is a town in the Northern Province of Sri Lanka and the capital of that province. This is located in a peninsula attached to the mainland by a narrow strip of land. The above peninsula and a few small islands to the west side form the region generally referred to as Jaffna region. This region, has a population of approximately one million and mainly the peninsula has a high population density The people living here are mostly Tamils ethnically related to the south Indian people and have close cultural relations with the people of the southern most Indian state of Tamil Nadu and they both speak a Dravidian Language named Tamil an ancient language. Most of them are Hindus by religion and the customs described here belong to them. 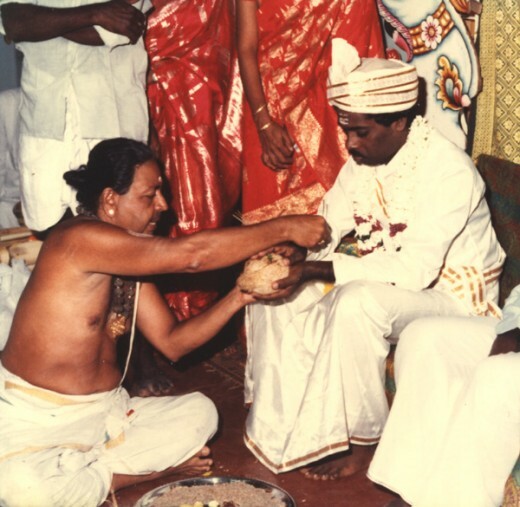 Although the wedding customs in Jaffna have lot in common with their counterparts in India, Jaffna weddings customs have some significant differences too. In the past, before the advent of European rule in this region, the weddings were fully based on local customs. 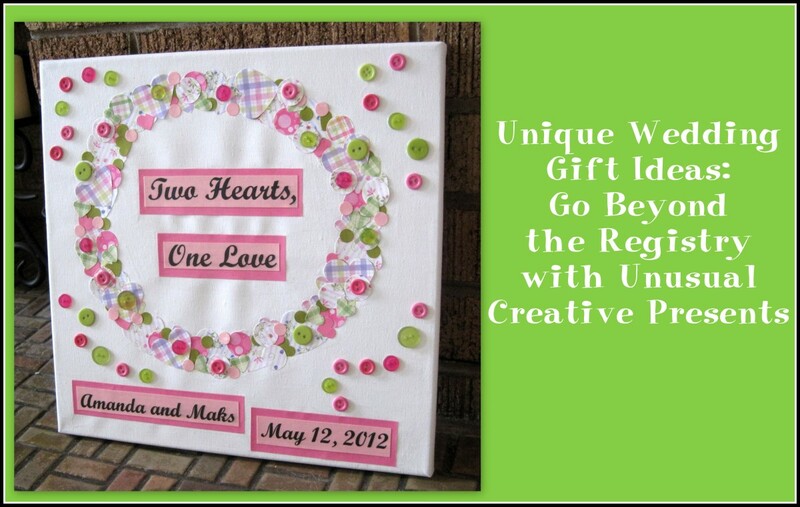 However, later with western influence, the legal registration of marriage has become an important part of weddings. Generally, this registration ceremony is fixed before the traditional wedding. This event is usually taken place in Brides house. The bride wears traditional costume. This includes silk sari and different types of gold jewellery. 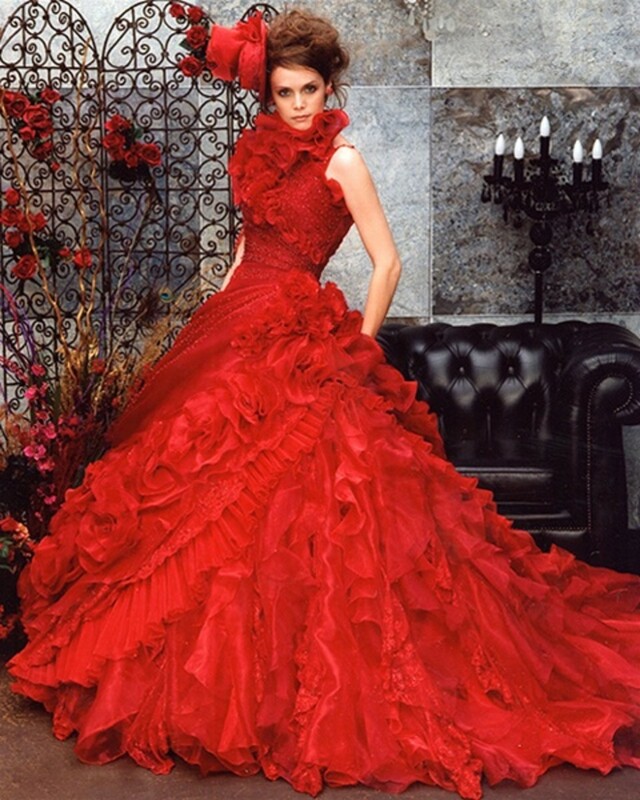 However, these days bridegroom, appears with western dress. They also change their rings in front of the registrar in western style and put their signature on the marriage document. Relative and close friends are invited for this ceremony and a lunch is arranged there in traditional way to those who attended the function. 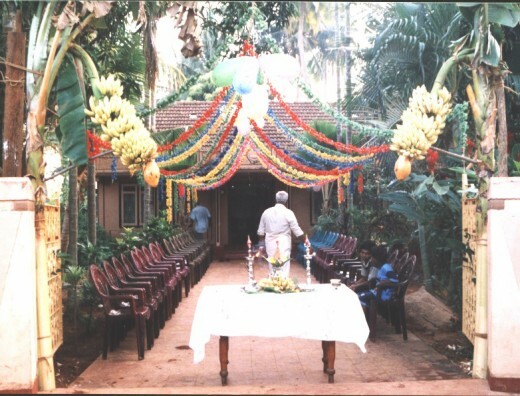 Entrance to the venue of a wedding in Jaffna. Note the Plantain plants and "full Pot" with traditional lamps. A Jaffna style Thaali, the nuptial cord, made out of gold. 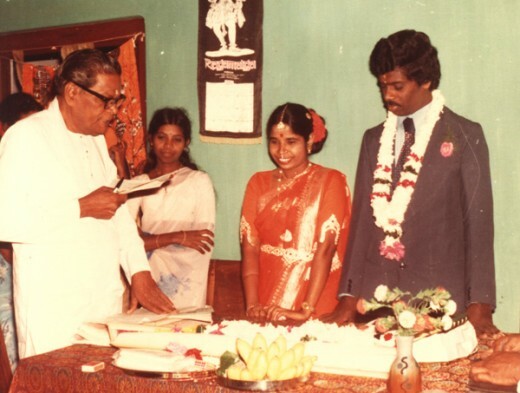 In Jaffna the wedding ceremony takes place either at brides house or at a Temple. In the recent past wedding halls have been constructed within many temple complexes. 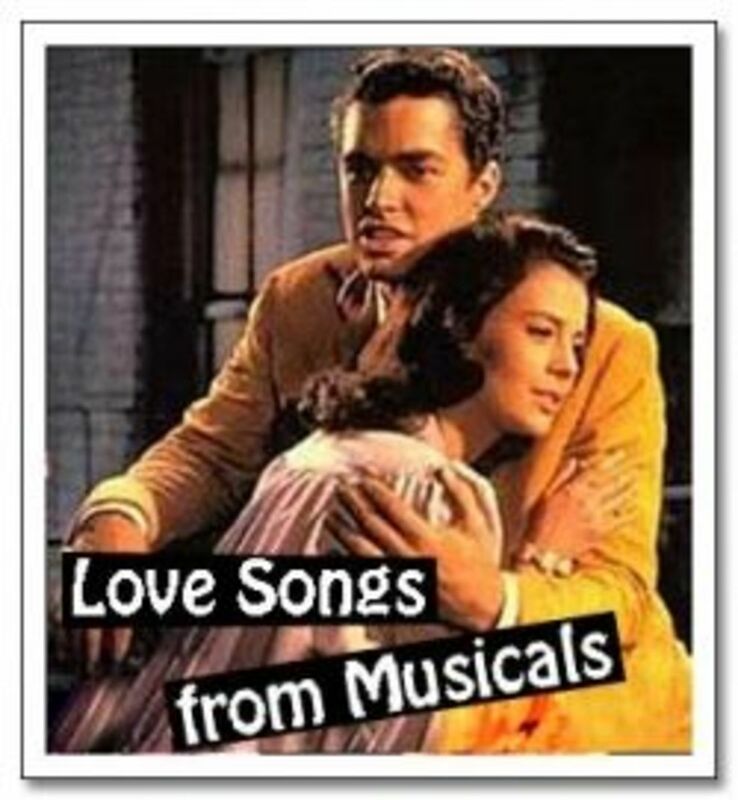 A few decades ago, arranging weddings at home was regarded as more respectable. Large temporary sheds are built in front of the house to accommodate the people who attend the wedding ceremony. This interior of sheds are clad with white cloths and decorated with flowers, garlands, tender coconut palm leaves, colored papers and other materials. A decorative wedding seat is made within this structure. This seat is generally made by assembling readymade components made out of wood, velvet cloth, other brightly colored fabrics, glass beads with glittery coatings etc. At the entrance to the house compound plantain plants are erected on both side with the bunch of fruits. Here, on a table Niraikudam, which literally means "full pot", is placed with traditional lamp and other auspicious items. This "full pot" is regarded as a symbol of prosperity as well as invitation. Fig.3 During gold melting ceremony. Gold coin is handed over to the Gold Smith. 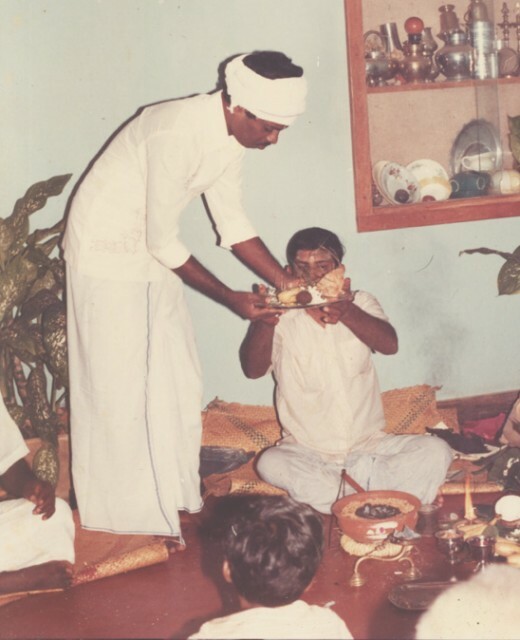 The most important item in a Hindu marriage in Jaffna as well as in South India is a nuptial cord called Thaali. During the wedding the bridegroom tie this cord with three knots on brides neck. This is the climax of the wedding ceremony and in the past ladies never remove from their neck when their husband is alive and they give great respect to this thaali. 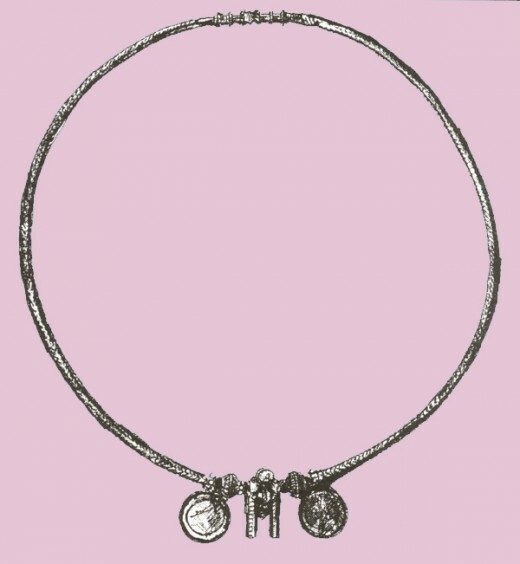 In fact Thaali proper is a small pendant attached to the cord. The groom gives this to the bride, Most of the people belong to middle class and above make this thaali and the cord out of gold. Poor people get the thaali made of gold. They use thick cotton thread, colored with turmeric paste, for the cord. Turmeric is generally regarded as an auspicious item among Hindus. Some even use a piece of turmeric as thaali. A few days before the wedding day, a small ceremony with a small gathering of very close relatives is held at grooms house. This is arranged for melting the gold for making the thaali. Gold smith, who was commissioned to make the thaali, performs the ceremonial melting. The groom would sit in front of the gold smith during this melting process. If the gold melt and harden to a uniform round shape piece, it is regarded as a good sign. Gold smith will use this gold for making thaali. 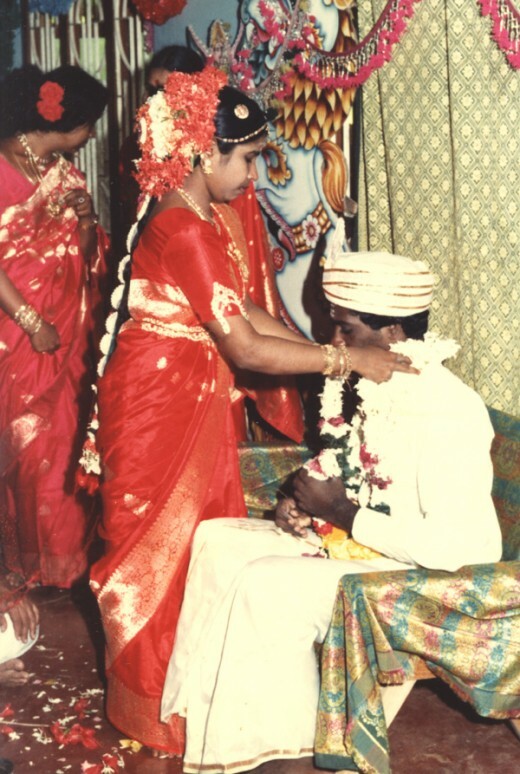 Climax of the Jaffna Hindu wedding, tieing Thaali, the nuptial cord on brides neck. 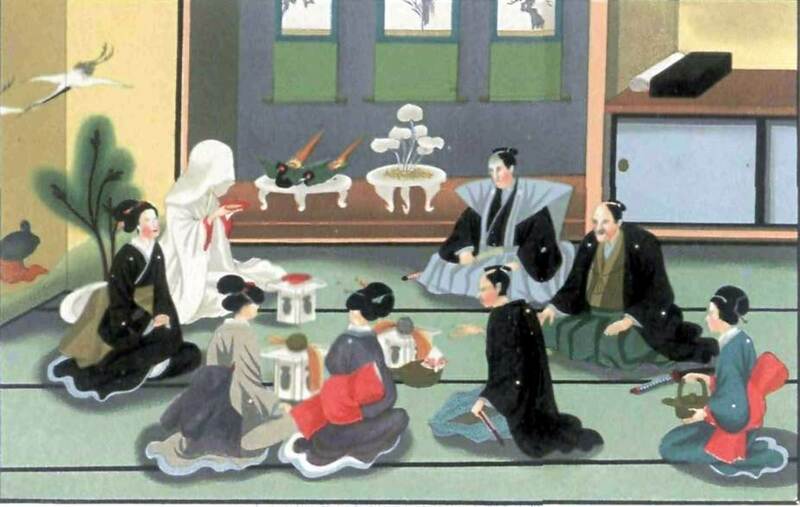 This wedding ceremony is held in traditional style. Bride, Bridegroom and the visitors wear traditional dresses. During the wedding ceremony one of the bride's brother usually a younger one would act as groom's companion. He also would wear a costume similar to the groom's one. He goes to bridegrooms house with his relatives and accompany the groom to the venue of the wedding. A Hindu priest officiates the wedding ceremony. Various elements and activities of this ceremony are highly symbolic and it is not appropriate to explain everything here. The priest would sit in front of the ceremonial wedding seat and he creates a small fire there. The ceremony takes place in front of it. When people refer to weddings they say that the Fire witnessed these. First the groom come and sits on the seat. The priest performs certain rituals. After this the bride is brought to the seat by her companion usually one of the groom's sister. She sits on the write side of the groom. A new silk sari is presented to the bride and she goes back and changes her dress and come back again. The rituals would continue and as a climax the groom ties the nuptial cord on the neck of the bride. At this point she becomes the wife of the man and switch their places so that the bride sits on the left side of the groom. As per Hindu tradition the ones wife sit on her husband's left side. During the wedding ceremony the traditional music is played. At the end, those who attended the wedding greet the couple by spraying rice mixed with some other auspicious things on their heads. After the ceremony is over lunch is served for the guests on plantain leaves on the floor. 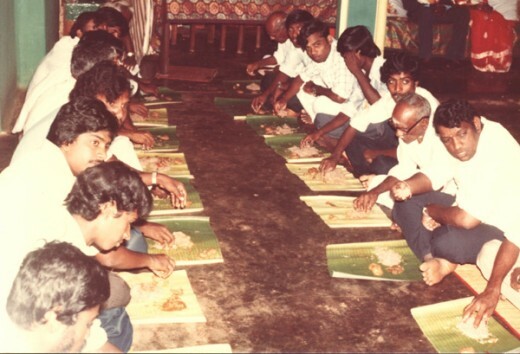 Those who present during the wedding are sitting on the floor and having lunch on banana leaves. The Hindu marriage symbolizes the physical and especially the spiritual union of man and woman. The rituals of the Hindu marriage ceremony, highlight the interdependence and the complementary nature of man and wife relationship. very nice writing with illustrations.. good work.. Thanks for the great Hub. It's always interesting to learn about different customs. Thanks for all your encouraging comments. Really interesting info, especially about the Thaali--thanks! Thanks for this great hub, and especially the beautiful pictures!